Windows Mobile or Pocket PC Phone users who use multiple calling card with complex dialing sequence or has to add a prefix to a phone number to call using IDD access code to overseas for cheaper rate will surely denounces the lack of calling card or prefix dialing feature in the PPC Phone. Unlike dialing process in popular Nokia phone, it’s impossible edit the number of dialpad to add in prefix or sequence before dialing. 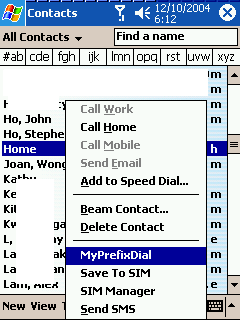 In WM2003 or older, WM5 and even the latest WM6 phone edition, users have to remember the complete long telephone number, and retype the digits on the dial pad after manually adding whatever prefix and postfix, unless users want to save the the friends’ or family members’ number with prefix too in the Contacts book. Some brands of PPC Phone comes with special dialer application that adds in IDD prefix or calling card sequence dialing functionality to simply local and overseas calling, such as O2 Phone Plus. Unfortunately, O2 Phone Plus cannot be downloaded and installed on non-O2 devices. MyPrefixDial, a PPC software by Paul Chow, is an alternative to those unable to use O2 Phone Plus and other brand-locked dialer with prefix dialing support. MyPrefixDial can add a prefix to the phone number before dialing automatically so that caller does not need to manually type in special access number or calling sequence for different IDD or long distance local discount services that caller used to save call charge. 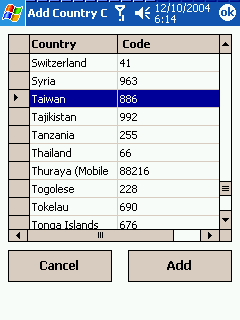 MyPrefixDial supports profile feature and country code. One minor disadvantage is that MyPrefixDial can only be accessed from Contacts, and not from phone dialpad or call history. That’s mean all calling has to be initiated from Contacts, and users cannot be select from Missed Call list or type to search in dial pad to use MyPrefixDial. MyPrefixDial is designed for Pocket PC (Windows Mobile) 2003 Phone Edition device, such as O2 Xda II, T-Mobile MDA2, DOPOD 696, i-Mate PocketPC. 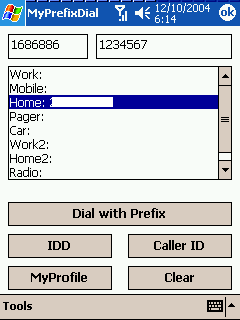 But in fact MyPrefixDial also works on most other Pocket PC Phone based on newer Windows Mobile 5.0 (WM5) and Windows Mobile 6 (WM6). Download MyPrefixDial v2.1 (No longer available).